I just visited Wikipedia to-day. I know I should have done it ages ago and in deed I have been meaning to ever since I read about it in a business article. The article was actually a comparison between Encyclopedia Britannica and Wikipedia. For those of you who aren't familiar with Wikipedia, it is a free on-line encyclopedia that is being constantly updated by those who visit - yes that means you or me, if we think that a little piece of information is missing or needs clarification or whatever. You buy some yarn to knit a project. You have a little yarn left over and so you buy more yarn to add to the little left over to make another project. Well then you have more yarn left over and so on and so on until you have a huge stash of yarn, hundreds of projects and guess what - no time!!! Take heart! A friend of mine passed away a year ago last December. She had quite a number of unfinished projects left. Well a neighbour, who also had a closet full of unfinished projects, dropped by to ask if there were anything she could do. Of course the family - which was actually just my friend's mother, who is well into her 80's said - no, thank you, your thoughts are help enough. Well this amazing neighbour asked if she would like her to finish the unfinished projects. Now this has to be a gesture not of this earth. I think that it comes pretty close to the sublime. I understand that 3 or 4 projects have been completed with more on the way. So knit away. If not finished in this life - maybe in the next! Oh, yes back to Wikipedia. Well, to put my experience of my first visit to the Wikipedia site into words, I have to say "wicked", as my 12 year-old would say of the snowboarders who push the limits of their art. I am constantly "blown away" by the possibilities of the internet. I often think that Marshall McLuhan should be alive to-day to see his prediction of the global village a reality with so much more. Here's the site: http://www.wikipedia.org/ enjoy! e-mail address and a definite OK to post pictures of her tea cups - not this one - which I will do tomorrow, I hope. 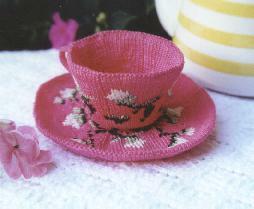 No this is a pattern I did after Debbie taught me how to knit a teacup. It's called Tea Roses and it is me pushing the limits of my ability in knitting. Debbie is pushing her (our) limits again. She said that she is working on a series of things that are changeable. Perhaps simple mechanical things or other means of altering or playing around with knitted things. I said that I had fixed a mortis lock on the weekend - but it wasn't knitted - somehow I don't think that this qualified! It does, however, remind me of an old joke - a real estate agent trying to sell an ancient & reportedly haunted house was searching around for the key, when his colleague said - don't worry - it's a mortis a skeleton will let you in. Sorry, I couldn't resist.